At the pinnacle of any pilgrimage to France is a visit to Notre Dame Cathedral, one of the best-known churches in the world, and a pinnacle of French architectural and cultural heritage. While beautiful throughout the year, Advent and Christmas is also a particularly glorious time to visit this magnificent expression of French Catholic culture. The Cathedral of Notre Dame (meaning, Our Lady; the Virgin Mary), was built in the 12th century on the foundation of a previous Cathedral, as per the order of King Louis VII, who sought to increase the prestige of Paris through the dedication of a magnificent Cathedral suitable for the capital of France. Designed in what became known as French Gothic style, it took over a hundred years to complete, with another major addition added in the 14th century with the erection of supporting arches – known as “flying buttresses” to help the massive structure sustain its vaulted ceiling. While the architecture alone would be enough to rank it among one of the greatest buildings of the late Middle Ages, it is equally famous for its elaborate stone sculptures and other treasures. 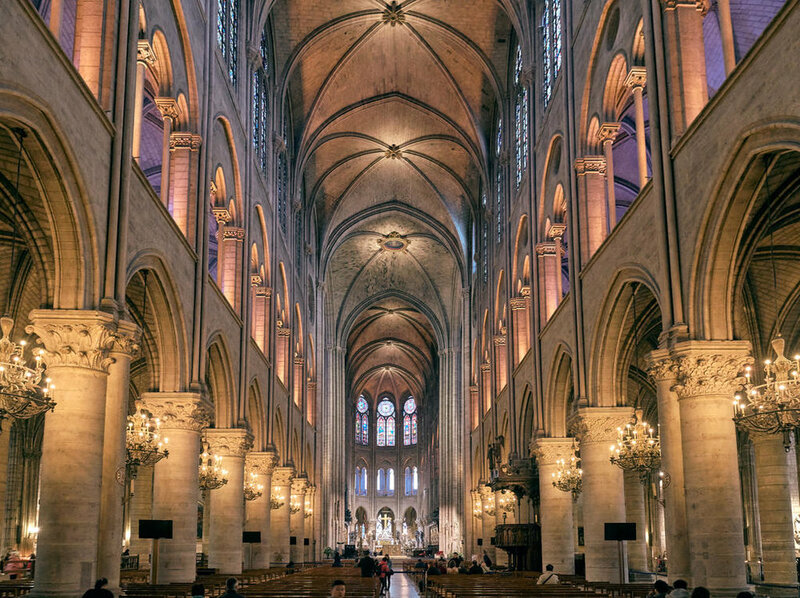 Notre Dame is sometimes described as the sort of Cathedral which became known as a “poor people’s book” – meaning that the structure itself would become an illustrative catechism of the Catholic faith through its design and artwork. The great six-vaulted ceiling of the nave, supported by the exterior flying buttresses, replete with its famed stone gargoyle rainspouts and other creatures. The illustrative stone portals of the three great doors of the façade, including the intricate depiction of the Last Judgment over the central portal. The three enormous stained-glass Rose windows, each encompassing geometric patterns as well as illustrations of Biblical scenes along with depictions of saints. ·The 8,000-pipe organ, dedicated in 1868; one of the most complex of its kind. A beautiful procession before Midnight Mass is held on Christmas Eve, after which the service is held in the full Cathedral. The magnificent organ of the Cathedral and the Cathedral choir perform time-honored Christmas hymns, not least of which is the time-honored French Carol, Le Divine Enfant. Another tradition of the Cathedral is to have a large mechanical crèche in the grand Italian tradition, depicting anachronistic European village life and the Holy Family in the Manger. Yet Christmas is not a one-day event, with the Advent season also being a time of joy and celebration. Choir concerts are held at the Cathedral on several dates, while outside the Cathedral, a long-standing Parisian tradition is the Christmas market. From Medieval times, principal cities of Europe were awarded designations as market towns and were awarded certain trading privileges, while a feast day of the Church, in particular major feast days such as Christmas, would be cause for annual celebrations. This tradition continues each December in Paris outside the Cathedral and elsewhere, with merchants and vendors offering Christmas sweets and a wide arrangement of delicacies as well as gifts and ornaments for the holiday shopper. Along the famed thoroughfare of the Champs Elysees, festive lights, imaginative storefront window displays, and other decorations provide a wonderful holiday atmosphere, while still others brave the cold weather to enjoy ice skating rinks and other entertainment. Should the holiday season ever find you in France, be certain to create a memorable Parisian experience and discover both Cathedral and capital in the spirit of Christmas. Visiting Notre Dame Cathedral is an incredible experience at any time of the year. All Good Shepherd pilgrimage tours to Paris, France include a visit to Notre Dame, as well as many other wonderful destinations across the city and country. For more information on how to plan your next pilgrimage, contact info@goodshepherdtravel.com.